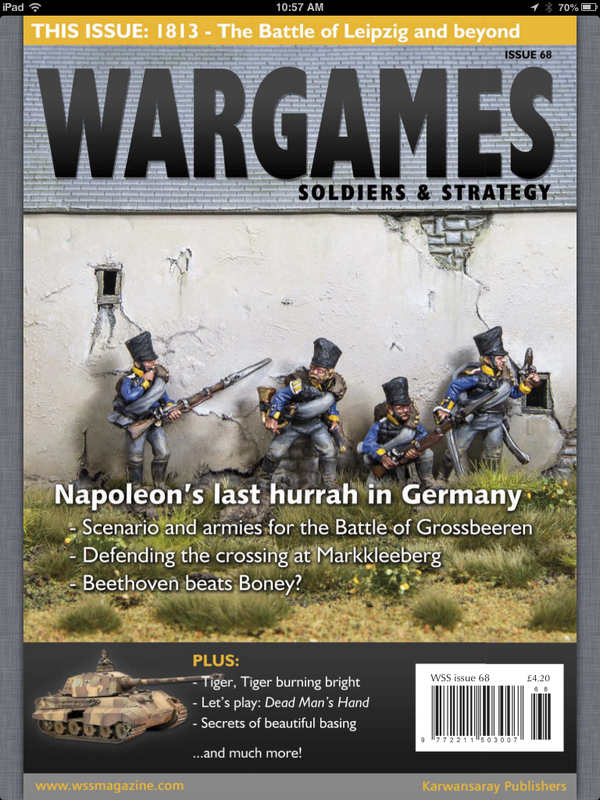 Last night I downloaded the latest issue of what is at the moment my favourite Wargames Magazine. It was 12:30 am but I had to spend some time having a good look through it. As with issue 67 before, I found myself falling into the usual reading pattern for this magazine – start with a quick look at Richard Clarke’s column “Up Front”, followed by Rick Priestley’s “This Gaming Life” and then back to the editorial. The other articles will provide some much needed quality reading over the next few days. The theme for this issue is the The Battle of the Nations – Leipzig, 1813. There are 5 articles based around that battle and as I keep umming and ahing about moving into Napoleonics, this should cause me more consternation – doubly so as Anthony has been receiving some Napoleonic reinforcements. Other articles include an interview with Phil Smith of Osprey Publishing; a piece on the 6th SS Panzer Army (think Tigers); Leach and Hogan at Festubert (Word War 1); Scipio vs Caesar (Ancients); Weathering tanks and other vehicles; modelling the 8th Army in plastic; doing really very nice bases; and some game reports (think Western, then VSF). Also we have Mike Evans writing a column; Sam Mustafa on complexity in gaming; plus the usual figure, game and book reviews. It was 1:00am and time for sleep but as it is approaching beer o’clock here in Singapore, I’ll be the soul sat at the bar with a pint in one hand and WS&S on the iPad in the other. Available from Karwansaray Publishers in hard copy and digital and thoroughly recommended. Beer in one hand??? Don’t you mean Coke Zero.